The Nurse Practitioners of Oregon (NPO) periodically conducts a survey of all Oregon nurse practitioners (NPs) to help evaluate practice trends and issues that are important to Oregon NPs. The full set of results are available free to NPO members and NPs who participated in the survey. 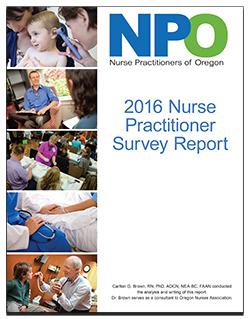 If you are interested in receiving a copy of the full results, please contact the Nurse Practitioners of Oregon via email at NPO@oregonrn.org or by phone at (503) 293-0011.